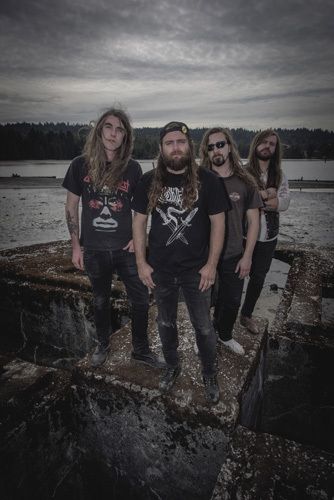 Formed some nine years ago in Vancouver by high school friends, Black Wizard has delivered three full-length albums. 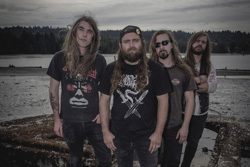 On the strength of those releases, the band has done some extensive touring both in North America and Europe with notable bands such as Red Fang, Killswitch Engage, Volbeat, Royal Thunder, and Weedeater. They return with their fourth long player, Livin' Oblivion, the second release with France's Listenable Records. Black Wizard's sound is more than a little deja vu all over again. The foundation is traditional heavy metal, something of a mixture Iron Maiden with Thin Lizzy. Yet there's also something of a latent doom metal element to their music as well, like Candlemass mixed with Electric Wizard. The music can be both fast and spry from the energy of twin guitar harmony and leads, then also daunting and heavy from the deep, thundering, rhythm section. Mentioning the twin guitars, Adam Grant and Danny Stokes deliver massive amount of blistering and soaring solos. If you remember classic heavy and doom metal with awesome guitar work, you will dig Black Wizard and want Livin' Oblivion. 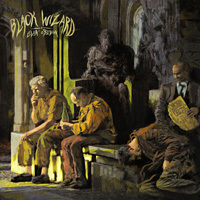 In the digital promo package from the label, Black Wizard provided a track-by-track description of the album which you can view online. But let me mention a few highlights. You'll find quick paced numbers, which may remind you of early proto-power metal with Feast Or Famine, Two Of These Nights, and Portraits. That doom metal motif rises within the title track and Heavy Love, with both songs having an expansive arrangement for an epic feeling. With Eternal Illusion, you get a true sense of how Black Wizard uses guitars to guide a song. The arrangement begins with a sharp twin guitar riff assault lifted by pummeling drums, again for an epic feeling. Finally, for Cascadia, Black Wizard dials things back, if only for a little bit, with the song having both lighter parts and a reduced tempo. In the end, if you love traditional heavy metal infused with a bit of a doom metal nuance, you will enjoy Black Wizard's Livin' Oblivion. Recommended. If you love traditional heavy metal infused with a bit of a doom metal nuance, you will enjoy Black Wizard's Livin' Oblivion. Recommended.